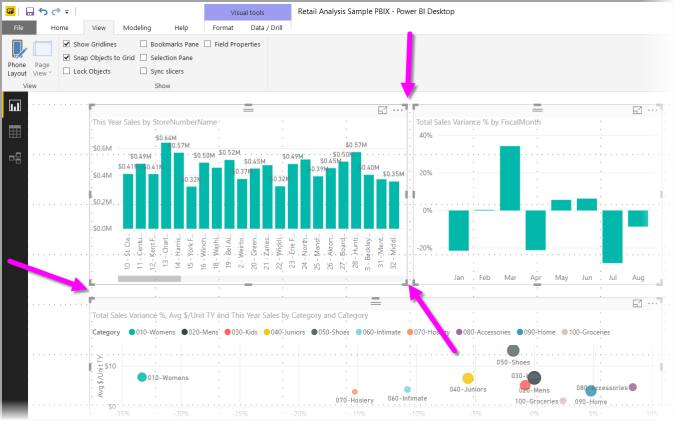 The Power BI Desktop report canvas provides gridlines that let you neatly align visuals on a report page and use snap-to-grid functionality so the visuals in your report look clean, aligned, and evenly spaced. 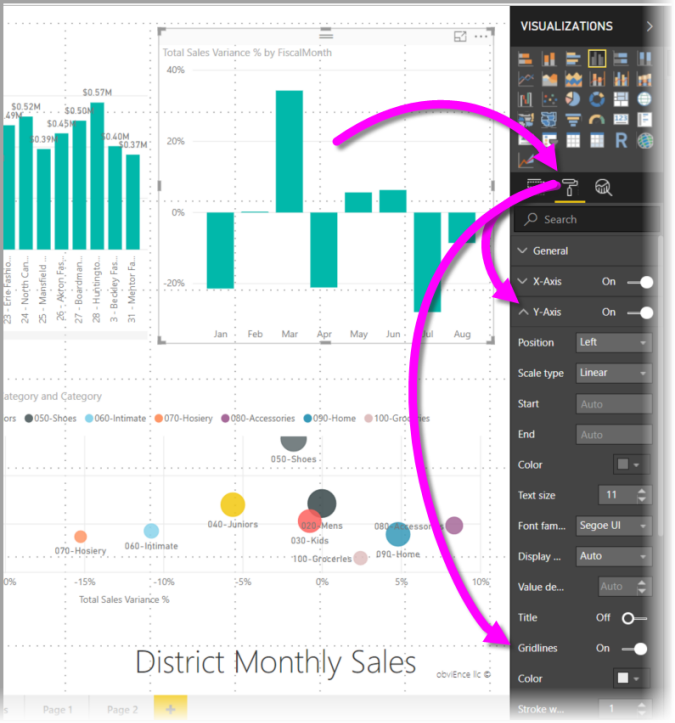 In Power BI Desktop, you can also adjust the z-order (bring forward, send backward) of objects on a report and align or evenly distribute selected visuals on the canvas. To enable gridlines and snap-to-grid, select the View ribbon, then enable the checkboxes for Show gridlines and Snap objects to grid. You can select one or both options; they operate independently. If Show gridlines and Snap objects to grid are disabled, connect to any data source and they become enabled. Gridlines are visible guides that help you align your visuals. When you're trying to determine whether two (or more) visuals are aligned horizontally or vertically, use the gridlines to determine whether their borders align. 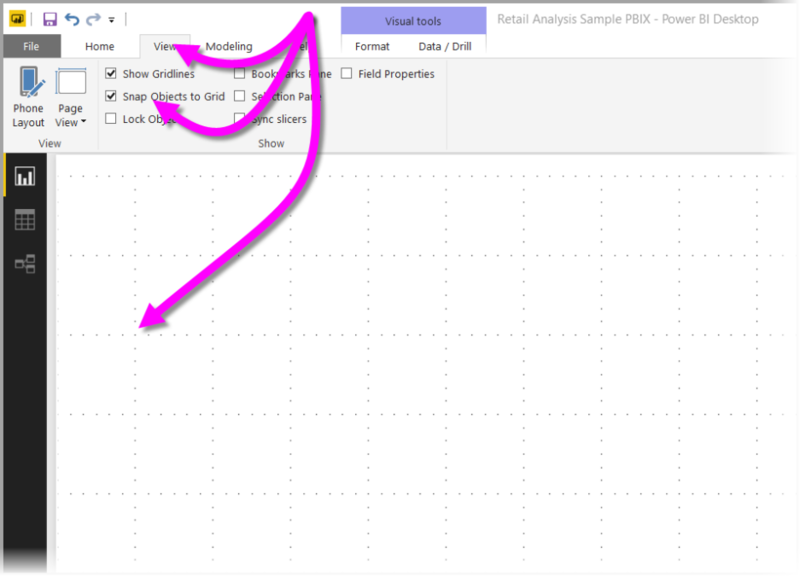 Use Ctrl+Click to select more than one visual at a time, which displays all selected visuals' borders and shows whether the visuals are properly aligned. 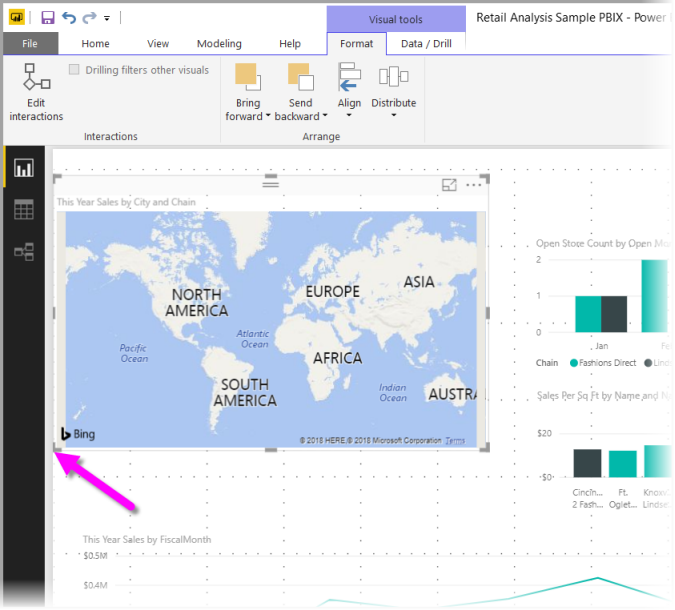 Modifying certain elements of gridlines can be especially useful in reports where dark backgrounds are used for visuals. The following image shows the Gridlines section in the Y-Axis card. 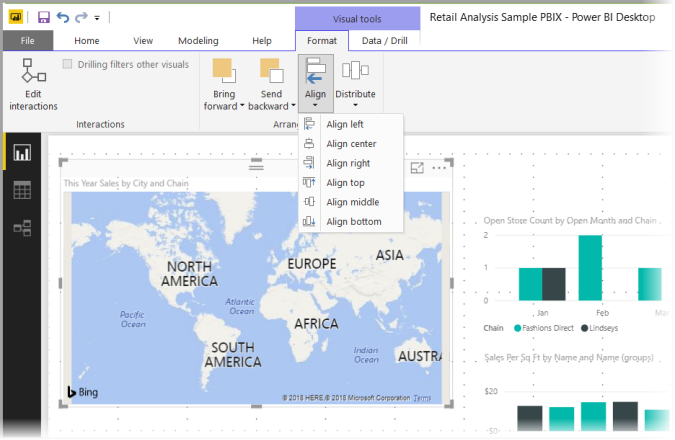 When you enable Snap objects to grid, all visuals on the Power BI Desktop canvas that you move (or resize) are automatically aligned to the nearest grid axis, making it much easier to ensure two or more visuals align to the same horizontal or vertical location or size. 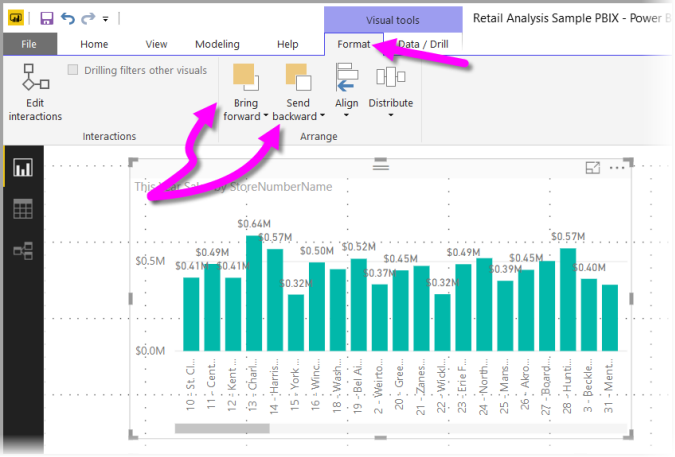 And, that's all there is to using gridlines and snap-to-grid to ensure the visuals in your reports are neatly aligned. You can manage the front-to-back order of visuals in a report, often referred to as the z-order of elements. This feature lets you overlap visuals in any way you want, then adjust the front-to-back order of each. You set the order of your visuals using the Bring Forward and Send Backward buttons, found in the Arrange section of Format ribbon. The Format ribbon appears as soon as you select one or more visuals on the page. The Format ribbon lets you align your visuals in many different ways, which ensures your visuals appear on the page in the alignment that looks and works best. 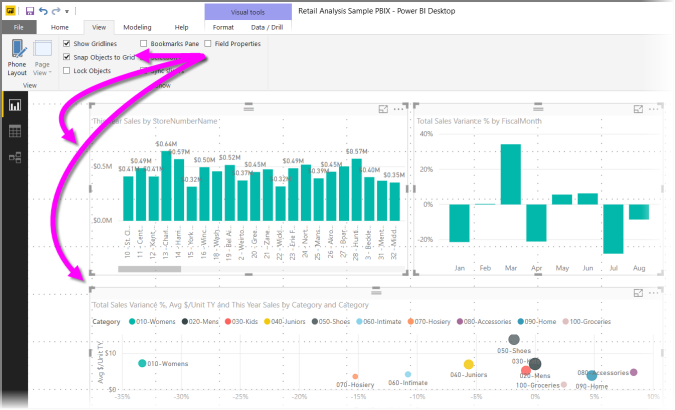 The Align button aligns a selected visual to the edge (or center) of the report canvas, as shown in the following image. When two or more visuals are selected, they are aligned together and use the existing aligned boundary of the visuals for their alignment. For example, if you select two visuals and choose the Align Left option, the visuals then align to the left-most boundary of all selected visuals. 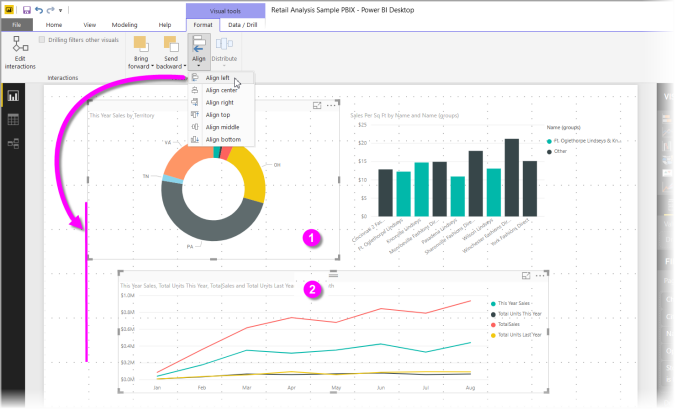 You can also distribute your visuals evenly across the report canvas, either vertically or horizontally. Just use the Distribute button from the Format ribbon. 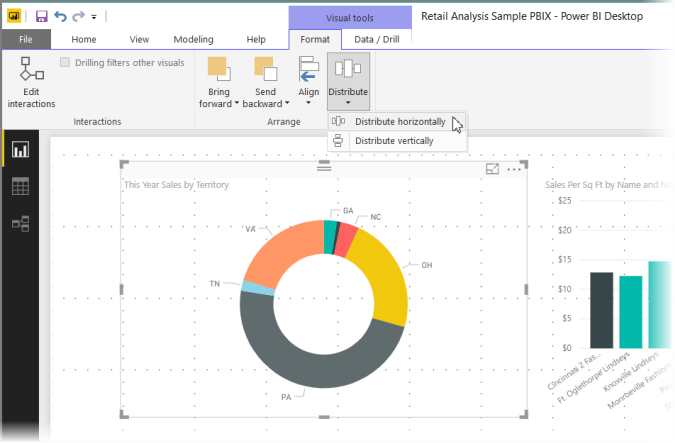 With a few selections from these gridlines, alignment, and distribution tools, your reports will look just how you want them to.